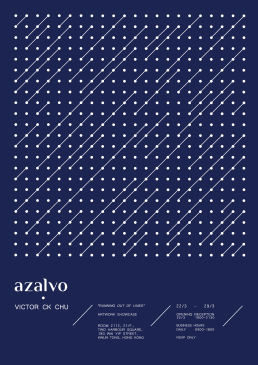 azalvo pleased to present exhibition of Chi Kuen Victor Chu (b. 1989), a graphic art and illustration artist from Toronto, Canada. Chu’s work has been widely praised for its limited palette and handcrafted graphic precision quality. The works presented in ‘Running out of Lines” are part of his simultaneous tenacity in presenting a new series of works titled “II/III” that introduce how he further pushes the boundaries of 2D graphic elements into a higher level of aesthetic possibilities. Drawing the lines individually by hand, Chu wanted to record the time of him missing certain person. Since time and memories do not have a significant shape, starting individual works with irregular and unrestrained arrangements of line, and sometimes installing line or geometric related material, which would further maturate into seemingly mathematical compositions, yet exhibit various scientific simplicity of a structured imagery, and could be seen as a kind of psychological graphic or symbol. Victor conveys how alteration of formats tests the boundaries of tangible and interactivity of art. Upon closer inspection, the viewer can note that by adding different materials, he has subtly introduced movement into the unmovable, rigid painting, whilst adding further dimensional depth of work and changes viewer’s interaction with various acts of intervention in both realms by opposing the flat with objects pasted onto it.